I’ve been trying out the Derwent Inktense blocks, a lovely and exciting alternative to normal watercolour paints that will produce really strong tones. They are excellent for working outdoors, and well worth trying if you are having difficulty with watercolour paints, or enjoy approaching it in a slightly different way. This is a simplified composition of the river that runs through our valley, and my aim was to try out some basic techniques. Creating a wash was achieved by applying the stick across dry paper and then wetting it with a round brush – a number ten worked well on a painting this size (approx. 5″ x 8″) – use as large a brush as you can so that you employ fewer strokes. Mixtures were achieved by overlaying colours again on dry paper, and then applying the water. With the foreground water I laid a second application of stronger colour after the initial wash had dried, and then re-wet the passage. 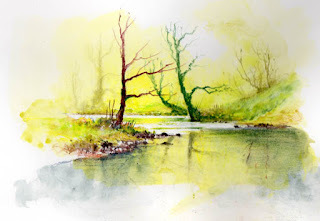 Wet-in-wet techniques can be effectively carried out by picking colour off the stick with a damp brush, then brushing it into a wet area on the paper as you can see with the tree on the far left. Don’t have much water on the brush when you do this. On the right of the composition you can see small trees painted with a number one rigger brush onto dry paper, but here I’ve had more water on the brush and tested it first on scrap paper to ensure the tone was not too dark, as I wanted it to recede into the distance, but not mist-like as with the left-hand tree. These are just basic methods done on the excellent Derwent 140lb paper which has a smooth surface that takes these Inktense sticks very well. I’ll be back with some more techniques with these superb sticks before long. This entry was posted in David Bellamy, Inktense blocks watercolor by David Bellamy. Bookmark the permalink. Inspiring. Thank you for showing us what can be done with the Inktense blocks. Just beautiful.